The fourth installment of my imagined advice column “Ask Roar from 34” probes vital topics including ballpark promotions, runners in scoring position, and excessive perspiration. Attendance is, um, down a bit in Baltimore these days. Any ideas on how to gin up excitement and put fans back in the seats? Promotions are key. For instance, how about tandem bike races featuring teams with a Baltimore connection? The Orioles have been horrendous with runners in scoring position this season. What can they do to improve? Petition Major League Baseball to allow our hitters to face our bullpen in clutch situations. Seems fair. I have some perspiration issues when I’m on the mound. Stop sweating and start living! I’m a slugger considering Baltimore as a free-agent destination this off-season. Why should I become an Oriole? I keep hearing people say “The writing’s on the wall” for me. Where’s the damn wall? I’ve been looking everywhere for it. You’ll find it soon enough. I would pay good American currency to have a go at Garrett Atkins in the drunk tank. Definitely a money maker. The O's should consider it. 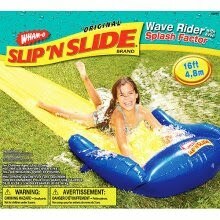 I'm also rather partial to the Slip 'N Slide idea. It would particularly fun to watch during walk-off home runs and close plays at the plate. Imagine that Corey Patterson game-ending throw from a week ago with a Slip 'N Slide in the mix. I can almost hear Joe Angel on the radio: "Wilson rounds third, dives onto the Slip 'N Slide, building good speed and … Wieters … tags him for the out. Splish-Splash, Josh Wilson took a bath. And this one is in the win column for the Orioles."